Every school of Taiji has its own unique combat push-hand. 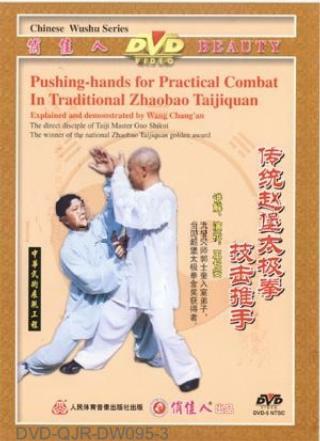 Master Wang Chang-an learns the traditional Zhaobao combat push-hand from Taiji grandmaster Guo Shi-kui. It features light footwork, agile body, lively waist and crotch, quick attacking, long lasting strength, advance quick body movement, unique body movements of attack by side body-stroke, back body-stroke, and window body-stroke and so on which is called "eighteen body-strokes of close attacks". Its forms are very powerful, simple yet practical.